F1420 BetterPosture Standard Kneeling Chair by Jobri - Jobri Back Care Ergonomic Products - BetterBack, BetterNeck, BetterRest, BetterPosture, Nubax Tri and Theracane. This is the basic standard model with a steel frame at a economical price. 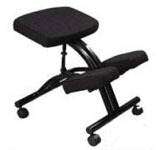 Made of polyurethane foam, metal Frame with fabric covering and nylon casters. Manual height adjustment. Height range:21" to 28.5". Seat Size:17.5" x 12.5". Knee cushion Size:6.5" x 11".